The Atlas is a really cool stove from Carbel. Not only will it provide cosy heat but the top oven allows you to bake at the same time, making it a very social addition to your home. The oven makes the Atlas an ideal multi-functional stove, great for use in open plan kitchens and living areas. The Atlas is also perfect for use in self-contained accommodation, for glamping sites or yurts. 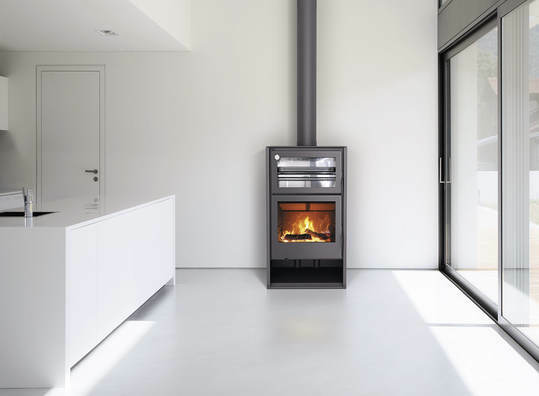 At 6-12kW heat output the Atlas is suited to the medium to large room, or to warm an entire smaller building. Add on the optional corner top to transform the Atlas into a version suited for installation to the corner of your room. The Atlas has a high 84% efficiency and is EcoDesign Ready.